In this Part, we will explore the meaning of the Tenth Shloka of Sri Vishnu Sahasranamam. The Lord is the Supreme Commander who has utmost compassion for those who surrender Unto Him and He guarantees their eternal bliss. He is the root Cause for the Universe and is the Creator of all beings. He protects his devotees and He is time itself. He is also difficult to grasp by demons and He is the One on whom the devotees can rely with total confidence. He is All seeing, Omnipresent, Omniscient and ever ready to shower his grace on his devotees. Hari Om! Sri Adi Shankara gives two interpretations for this name. ‘Suraanaam Devaanaam Eeshah Sureshah’ – The Lord of all the Devaas. ‘Shobhanadaatroonaam eeshah Sureshah’ – the chief among those who fulfil the desires of their followers. And He is su rA Isah – Best among those who can bestow blessings. Sriman Narayana, is the One who can fulfil the ultimate desire of the devotees – that is ‘Moksha’. Sharanam means One who grants refuge or safe haven to those in distress. He protects anyone seeking refuge irrespective of their status or merit. Bhagavan is the ‘Ultimate Refuge’ to those who are in misery. As Adi Sankara says ‘Aartaanaam Aartiharanaat Sharanam – He is called Sharanam because He puts an end to the miseries of those who resort to him’. He grants the wishes of those who surrender unto him, like Gajendra, Prahalada or Darupadi. Meaning: He who seeks refuge in me once, telling me that I am yours, I shall give him assurance of safety against all beings. This is my solemn pledge. Meaning: Fix your mind on Me; Engage your intellect upon me; Thereafter, you will live in Me without a doubt. Hence those who surrender to the Lord gets to live in Him. Sharanam also means a home and on this basis Swami ChinmayAnanda points out that He is not only the Home for those who have realized Him, but in Pralaya He is the home for all beings. He is also the final Goal or ‘Paramagati’ and the ultimate refuge to achieve Moksham or liberation. Bhagavan is the embodiment of pure and unadulterated joy or total bliss, Sharma essentially means this state of supreme joy. Both Parasara Bhattar and Sri Adi Sankara give the same meaning. ‘Paramaananda Roopatvaat Sharma – He is called Sharma because he personifies the state of highest bliss’. Vishva means Universe, Retas means seed. He is the seed Cause for the Universe and also the Universal Cause. The word basis can be interpreted as ‘Vishvam Kaaryam asya asti iti’ or ‘Vishvasya Karanatvaat’. He is the Cause and the Universe is the result. If the Universe can be compared to a tree, He is the seed for that tree! Needless to say Creation does not diminish the prowess of Bhagavan in any way because as the Upanishads say ‘Poornasya Poornam Aadaaya Poornameva Avashishyate- He remains perfect even after creating the perfect Universe’. Sri Parasara Bhattar notes that the purpose of His creation (or the Purushartha) is for His service and His service alone. As Adi Sankara says ‘Sarvaah Prajaah Yatsakaashaad Udbhavanti sa Prajaabhavah – The One from all beings have originated’. The previous Nama embraces all objects but here Prajaa only refers to living objects and in particular the higher forms of life with consciousness developed within. Sri Radhakrishna Shastri points out that while normal evolution starts with primitive forms and evolves to higher forms, Bhagavan decided to create the higher forms such as Brahma first, and then the forms that are not as accomplished, such as all the humans, animals, birds etc., later. One who never forsakes anyone. One who is like the Day that awakens people from ignorance. One who does not let His devotees perish. The first interpretation is based on “na hinah asya asti iti ahah -There is no one who is abandoned by Him. The second interpretation is based on the traditional meaning of the word aha – day. From that comes Pratyaham meaning every day and Aharnisham meaning day and night. So Sri Adi Shankara says ‘Prakaasha roopatvaat Ahah – He is called Ahah because he is bright as the day’. His brightness is not just physical but also the brilliance of intellect and knowledge. The third interpretation is derived by a-ha, where ha means destroy; One who does not destroy is a-ha; rather one who protects his devotees. This is a Story of Sri Thondaradipodi Azhwar, who was born to a Vedic Brahmin by the name, Vedavisarathar in Thirumandangudi. 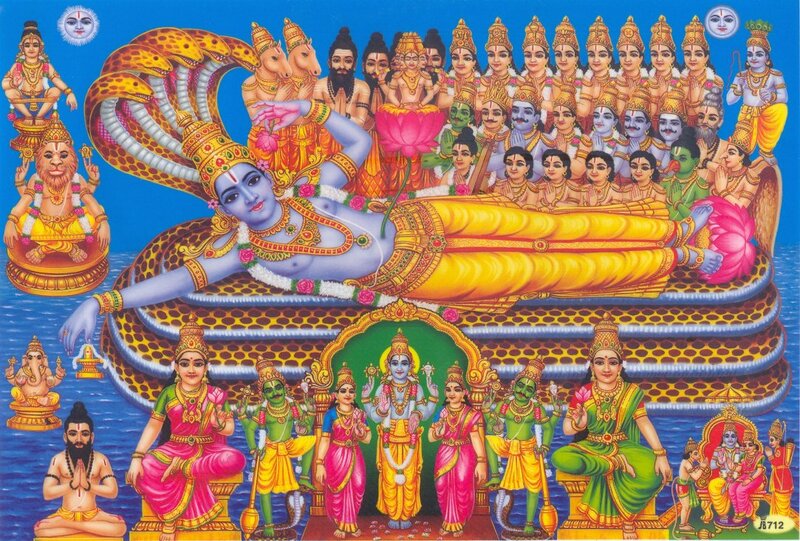 He was a manifestation of Vanamala (Divine Garland of Lord Maha vishnu) and he was named “Vipranarayanar”. He became highly devoted to Sriman Narayana and he took a vow to remain a bachelor throughout his life so that he could devote his time and energy to perform rituals to the Lord. Like PeriyAzhwar, Vipranarayanar too was interested only in garland rituals (poomalai kainkaryam). He migrated to Srirangam and he cultivated a beautiful garden (nandhavanam). He stayed there within the garden in a small hermitage. The Lord decided to play his ‘Leela’ with Vipranarayanar. One day, two sisters were coming back after performing a dance performance in front of Chozha King and were attracted by the beauty of Thondaradipodi Azhwar’s Nandhavanam. When they saw him meditating on the Lord, they were captivated by his Tejas and charm. He ignored their beauty but the beautiful younger sister, by the name Devadevi got more offended and in fact, challenged her sister that she would make the Azhwar her slave. In spite of her sister’s warning and caution not to endanger herself, Devadevi was adamant and decided to embark on it. Disguised and dressed as a Sanyasini, she requested him to accept her service to him at his place. Unaware of the plot, he agreed, however, he did not let her stay inside his hermitage. He maintained a distance from her and was as usual performing his rituals unaffected by her presence. One day, when it rained heavily she got drenched and was shivering. Vipranarayanar could not refuse her shelter and allowed her into his hermitage. Devadevi slowly aroused his sensual desires and Vipranarayanar fell for her beauty. She virtually made him a slave and he neglected his Seva for the Lord (kainkaryam) and his singing. His thoughts were only about Devadevi and he became so engrossed in his desire for her that he could not bear even a moment of separation from her. When she achieved what she wished, she went back to her place in Uttamarkoil (near SriRangam). Her mother did not allow Vipranarayanar to see her unless he brought some money, true to their profession. He felt isolated and was heavily lamenting the separation from Devadevi and did not know what to do. In the meanwhile, Lord Tiruvarangan felt it was enough play with His Bhakta (Devotee) and hence, He appeared as a servant of Vipranarayanar calling Himself “Azhagiya Manavala Dasan” and went to Devadevi’s house. He handed over the Big Golden vessel (Thanga vattil) saying that Vipranarayanar asked him to give this to her. Devadevi’s mother went in search of Vipranarayanar and let him meet her daughter. Next day, the archakars discovered one of the “vattils” missing in the Lord’s Sannidhi and immediately informed the King. The maid of Devadevi informed about the Golden Vattil in Devadevi’s house and the news reached the King. The King after hearing the information ordered the arrest of Vipranarayanar. Vipranaryanar pleaded innocence and said he was not aware of any Golden Vattil nor did he have any servant working for him, since he himself was so poor. But the King ignored his pleas and ordered him to be locked in prison. So, he landed up in a dark cell! 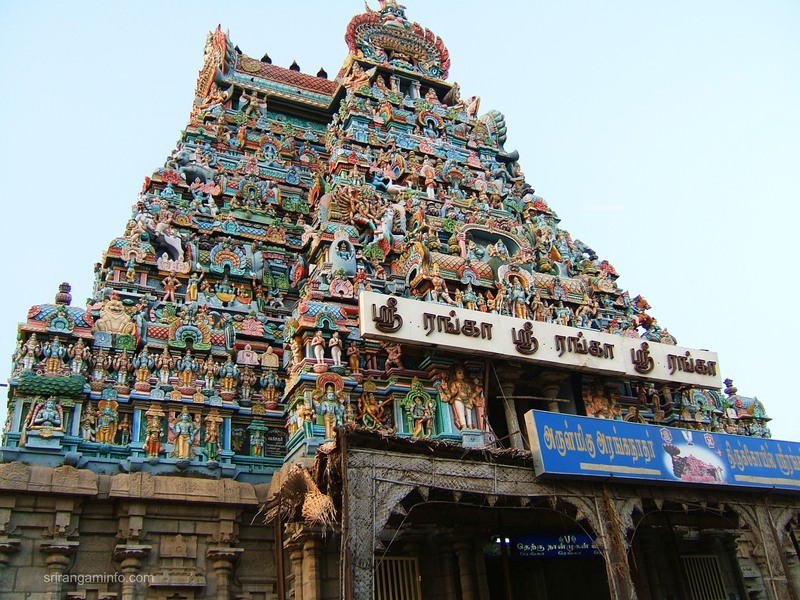 Vipranarayanar pondered over the entire saga and then he realised everything – his mistakes, his follies, his misdeeds of not performing his rituals to the Lord and begged for Lord’s forgiveness. The Lord appeared in the King’s dream and narrated the whole incident and said that Vipranarayanar, His dearest Bhakta, was innocent. The King released Vipranarayanar immediately and prostrated at his feet and begged for his pardon. 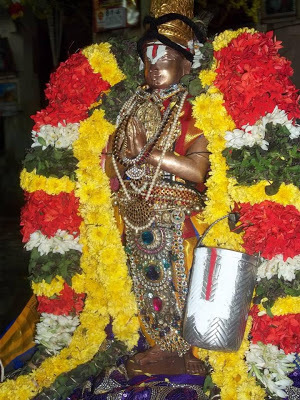 Vipranarayanar was greatly moved by the Lord’s Kaarunya bhaava and sang Pasurams full of Bhakti. Having gone through a traumatic experience with Devadevi, he never looked back; and since then, he became a staunch Bhakta and called himself the dust at the feet of Bhaktas (Thondaradipodi Azhwar). He composed two poems namely, Thirumalai (a garland for the Lord) and Thiruppalliyezhucchi (waking up the Lord). His Pasurams are marvellous compositions and one is certain to get moved by the Bhakti and longing for Lord Ranganatha. He did not sing at any other sthalam except SriRangam. Let’s look at one of his Great Pasurams and be blessed by Him. 1. He who lives for the upliftment of His devotees. This meaning is derived from the root vas – to live. Samuddharanaaya samvasati iti samvatsarah. 2. That Bhagavan is Time itself. In the Bhagavad Gita Chapter 11 Verse 32 Krishna says ‘Kaalosmi Lokakshaya Krit Pravriddhah – I am verily Time itself which can bring growth as well as decay to the World’. Vyaala is a name commonly used to denote a snake, a tiger or an elephant. What is common to these 3 is their elusiveness. The snake is elusive because of its slipperiness, the tiger because of its ferocity and the elephant because of its size. Sri Adi Sankara says ‘Vyaalavat graheetum Ashakyatvaat Vyaalah – Bhagavan is Vyaala because He is slippery like a serpent to grasp, or beyond grasp like a huge elephant. Or He is impossible to be controlled by the demons, like a ferocious tiger. Shri Parasara Bhattar gives an interpretation based on the root ‘LA’ – to take or accept. So Vyaalah is one who accepts the devotees irrespective of their qualification. The devotee may be an Asura by birth like Prahlada or a low caste woman like Sabari or the Princely Vibheeshana or even an animal like Gajendra, He accepts them all equally. Pratyayah according to Sri Adi Sankara is one who symbolises Prateeti or Prajnaanam meaning Universal Consciousness. According to Upanishad ‘Prajnaanam Bramha – Consciousness is Bramhan’. Here’s an interesting episode from the Ramayana. After befriending Lord Rama, Sugreeva seeks His help to vanquish the mighty Vaali. However, he is overcome by doubt regarding Rama’s prowess to defeat Vali. Sugreeva begins to extol Vaali’s valour and narrates the episode of Vaali’s fight with the mighty buffalo demon Dundubhi. As Vaali vanquished Dundubhi and hurled it, blood drops fell on Sage Maatanga. He cursed Vaali due to which Vaali is forbidden to enter the Rishyamukha mountain, which has now become a safe haven for us, narrated Sugriva. Sugriva also tells about Vaali’s prowess in piercing massive trees. Rama in order to quell his doubt and fear decides to demonstrate his prowess to Sugreeva. He sportively flipped the skeletons of Dundubhi by flicking it with his big toe without lifting his feet to a 10 yojana distance which is about 80 kms. Sugreeva, however, remains unconvinced and says to Rama. That when Vaali hurled it, He was tired, and this buffalo was full of flesh and blood. Rama smiled at Sugreeva and uses a single arrow to pierce 7 Sala trees. 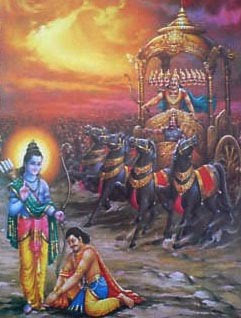 Sugreeva is impressed with Rama’s Valour and brilliance, convinced of his prowess, bows to him. Sri Adi Sankara interprets this as ‘Sarvaani darshanaatmakaani aksheeni yasya sah – He has eyes that see everything’. Sankara gives the following reference from the Sruti – “Vishvatash cakshur vishvaaksham – One who has eyes on all sides – One who has a Universal eye”. (TaittirIya Aranyaka 10.1, 11). Sri Parasara Bhattar interprets Sarvadarshanah to mean ‘He shows everything’ or projects himself in a multitude of forms and dimensions to his devotees. Swami ChinmayAnanda gives the following reference from the Bhagavad GIta(Chapter 13 Verse 14) – Sarvato’kshi shiro mukham’ – One who has eyes and heads everywhere. The Lord is Omnipresent, all seeing and ever ready to shower his grace on his devotees. The Lord is the Supreme Commander of all Devas and hence He is Sureshah. He is Sharanam as He has utmost compassion for those who surrender Unto Him. He guarantees eternal bliss and is Sharma. He is the root cause for the Universe, so He is Vishvaretah and since He is the Creator of all beings, He is Prajabhavah. He is luminous and radiant as Ahah. He is Samvatsara, time itself. He is Vyaalah as He is difficult to grasp by demons and He is Pratyayah, upon whom one can rely with total confidence. He is All seeing, Omnipresent, Omniscient and ever ready to shower his grace on his devotees and hence Sarvadarshanah. It’s great to know about ‘SRI VISHNU SAHASRANAMAM’. I often google out the meaning of each scripts and mantras. But now all I have to do just log in to your blog. Everything I want to know, it’s all in here. Very well done Sridhar. It’s easy to understand and very interesting. I just came to know about your blog and I will be following up everyday. My best wishes. God bless you. Thank you Hemamalini:) Glad to learn that you are liking it. May God be with you! Hari Om! Enjoyed reading and listening to this shlokam of Vishnu Sahasranamam!! As usual a wonderful job. Vipranarayanar story was pretty profound. Maya can lead us in the wrong path. But once Bhagavan’s devotee, He always forgives and protects 😊 Thanks again for yet another wonderful, fluent, clear explanations. Very interesting blog. Very blissful to listen to your audio & video of Vishnu Sahasranama. The narration is also very lucid & easy to relate. Though I will not be be able to read your narration every week due to time constrain I will surely follow your audio & video without fail. Thank you Mr. Sridhar & Shri Balaji for the great job. Thank you Nirmala 🙂 The audio was created keeping in mind that some may not have the time to go through the detailed blog but can still benefit by listening to the gist of the commentary. Glad to learn that it is serving its purpose! Thank you for following the blog. Please call me Sridhar! And BTW, let me know if there is a speaking opportunity at your University 🙂 Would be glad to be a visiting professor and talk on some topics of interest!